A long time resident of Battle Creek, Joe is a dedicated physician and public servant. With a medical degree from Wayne State University, Joe has practiced otolaryngological medicine (ear, nose, and throat) in his hometown since 1974. Joe also has degrees from U of M and Harvard. 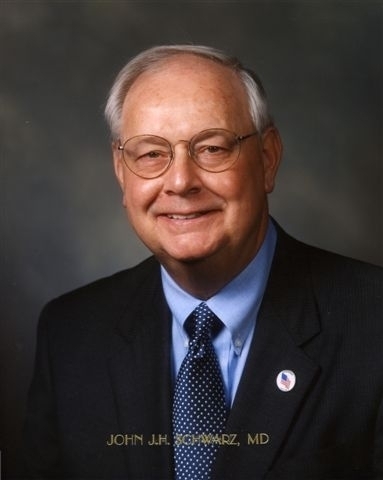 Elected to the State Senate in 1987, Joe served in the Michigan Legislature until 2002. In 2004, Schwarz was elected to represent the seventh district of Michigan in the US Congress. Schwarz is a member of The Republican Majority For Choice, Republicans for Choice and Republicans for Environmental Protection. In January 2007, Schwarz was appointed to Gov. Jennifer Granholm’s Emergency Financial Advisory Panel. Joe currently sees patients at Grace Health in Battle Creek and teaches in at the Ford School of Public Policy at the University of Michigan. In 2008, Joe led the successful passage of Proposal 2, which allowed state funding for embryonic stem cell research.